Quantitatively speaking I started the year off reasonably well, completing 12 books, including 5 by new-to-me authors. Fortunately the quality was generally good too and it was difficult to choose a favourite for the month but I’ve selected Katherine Howell’s WEB OF DECEIT. It was gripping enough to keep me glued for a single sitting stretching long into the night and it maintains Howell’s consistently excellent record of producing almost frenetically paced stories that manage not to feel rushed or lacking depth. There is a kind of surprising interconnectedness about Howell’s plots that I find particularly compelling and I loved this latest instalment about a man who survives a car crash only to die under a train later the same day. All three books were very good and I did enjoy the various contemplations about the possible end of the world. I only managed one post not containing a book review this month and, sadly, it was a return to the old familiar theme of the lunacy of book pricing here in Oz. I wonder if I will ever manage to go through an entire blogging year without ranting about this subject? I’ve read and reviewed 3 of my nominated 10 books by Australian women for this year’s version of the Australian Women Writers Challenge and am happy with that progress. My slightly complicated goal regarding book acquisition (buy less but buy local, audio books excluded) has proven interesting in that I only bought one book in total but it was from an overseas supplier (though it was an ebook purchased with a Christmas gift voucher that I would have felt ridiculous not using). My reading for the month came primarily from my pre-existing TBR collection and the local library with one book provided by the publisher. So my finances have done well but the local book selling industry is not, so far, benefiting from my self-imposed restriction on buying books from overseas. How did your reading year begin? Have you a favourite book for the year so far? Are you progressing well towards some of your reading goals? I’m having a very busy and very strange winter so far, book-wise. I went from Nero Wolfe’s exploits to Precious Ramotse’s and back again. Now I’m reading a non-crime fiction book, Barbara Kingsolver’s Flight Behavior, an interesting take on climate change, science, religion and the lives of an Appalachian family. However, I have just ordered the next Hanne Wilhelmsen book and the third Anthony Bidulka, with a Sjowall and Wahloo and Cath Staincliffe on the top of my TBR pile. I will duly note some of the above, such as The Sea Detective, although I reached my saturation point with severed feet last year, after reading a Kjell Eriksson and a Fred Vargas with those clues and could not read Dregs after that, as it also contained that element. Now I think I can face those severed feet once again. I’d love to read the Katherine Howell and will look out for it. Last year I read 10 books by women from Oz and was not disappointed in any of them. New to me Aussie authors were all good, and I hope to find more of them this year. I’ll skip the apocalypse, pre- or post- as my city went through Hurricane Sandy a few months ago, and it came pretty close. No lights, elevator, phones, computer, hot water, etc. I got by with reading mysteries by flashlight and talking to a neighbor via lantern. Many people are still suffering without heat during this cold spell here. Kathy the severed feet are a fairly minor plot point of THE SEA DETECTIVE so hopefully not too off putting for you as it’s a wonderful book – the segments on Indian culture are fascinating, if a little disturbing. I can certainly understand why you’re not keen to read any apocalyptic tales after having experienced Hurricane Sandy and its aftermath. It must have been a really grim experience for you all. Hopefully things improve quickly for those still suffering. Bernadette – I’m glad that you had a good reading month. And I’m absolutely not surprised that you chose Web of Deceit as your top January read. I like Howell’s work very much and it doesn’t surprise me in the least that it was that novel that kept you up really late reading. She’s done that to me a few times too. Interesting too how your reading seemed a little end-of-the-world-y. I wonder if people tend to do that with their reading – develop a pattern of reading about a topic, a place, an era in history, etc.. I know I’ve done it. Sounds like a good month Bernadette amd you’ve certainly read a lot. I think I liked Jo Nesbo more than you 😉 Agree about Ben Winters and I fancy reading the Scarrow sometime. I’ve The Sea Detective on my ‘wish list’ thanks to your review (I also like the cover a lot). A book for later in the year once I’ve worked the tbr down a bit. This is a very interesting list of books that I am mostly not familiar with. I plan to look at all the reviews but did not want to wait to comment. You definitely have me interested in Web of Deceit. I checked out the review for that and a couple of the other reviews for that series. I like the idea of a different paramedic each book, keeping the continuity with the same detective. One cannot go wrong with a Katherine Howell book. It’s not only the plot, but the detectives and paramedics are portrayed like real people with real ups and downs, emotions, family and work issues. 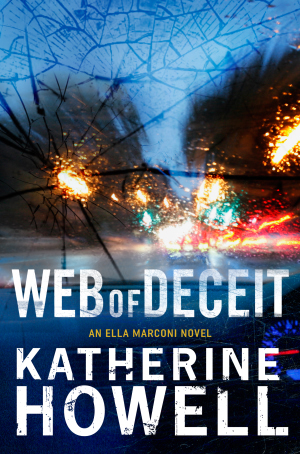 I loved Web of Deceit – and I agree it is probably her best so far!